This FREE festival is open to the public, where visitors will enjoy arts and crafts, chuck wagon cooking, living history, face painting, laser tag, museum exhibits, pony rides, square dancing, live performances and much more. The Governor’s Mansion will also be open for tours. 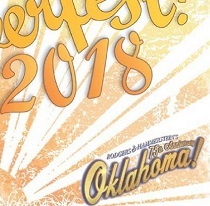 This year’s Septemberfest theme is “Rodgers and Hammerstein’s ‘Oklahoma!’” This celebrates both the 75th anniversary of the Broadway debut of the famous musical and the exhibit now on display at the Oklahoma History Center.